I could not possibly leave the topic of quinces without one more recipe that uses vino cotto. Through my research both of these ingredients have varied uses ranging from culinary to medicinal purposes - but that is another topic which I will write about at some later stage. The combination of the two used in making jam is what I will write about in this post and what a perfect match nature has provided! La Cotognata according to my father and the way his mother would make it involved using vino cotto (cooked must). During wine season the cotogne (quinces) would also be ripening on trees, picked and used in a range of dishes. My grandmother would poach pieces of quince in the vino cotto, adding flavour as well as sweetening the fruit. In ancient times quince would also be cooked with honey. I found a recipe using the process of making quince jam with the addition of vino cotto at the end of the cooking process - follow my Quince - Mela Cotogna recipe and just add a cup of vino cotto to the final cooking stage according to the specified quantity of pulp. The quince jam acquires another level of flavour which is very morish! 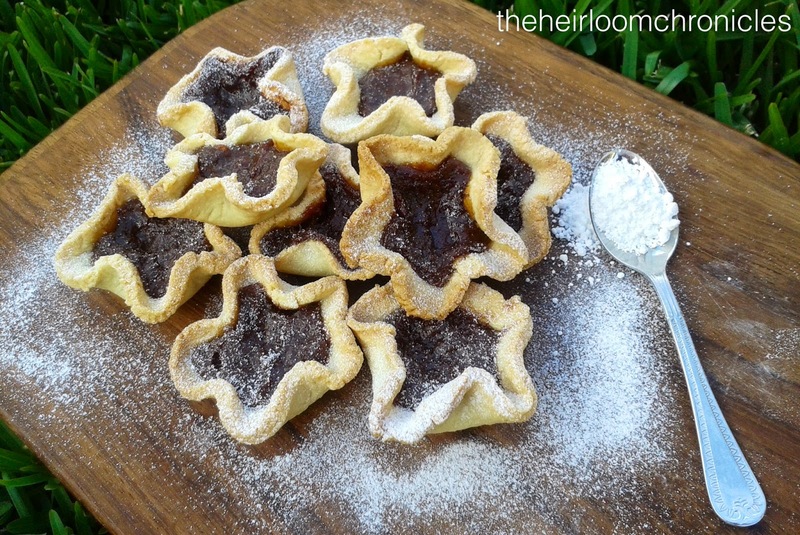 This will definitely be the hero of any sweet dish, so I decided to make some tartlets. Can I tempt you?! 1. Preheat oven to 190c. Process flour, almond meal, sugar and butter in a food processor. Add egg and process in bursts until mixture forms a ball. Transfer to a lightly floured bench and knead lightly until smooth. Wrap in plastic and rest in fridge for 15 minutes. 2. Divide pastry into 12 even portions. Roll out each on a lightly floured surface to 3mm thick and 8cm in diameter. Place individual circles on a shallow cup cake tin, lightly pushing them in place. Dollop a teaspoon full of cotogna and vino cotto jam in the centre and bring the edges slightly in. Bake for 15-20 minutes or until pastry is golden. Dust with icing sugar and enjoy!